Why do I need to clear current data from the Target Store in order to restart migration? Usually, restart migration means that something is wrong with the data on a Target Store. It can be influenced by 3rd party extensions, inappropriate development, bugs during shopping cart installation, etc. That is why launching a new migration (remigration) to a store, filled with corrupted or modified data, is not recommended since there is a risk of mixing/duplicating data. In order to avoid this you will need to clear current data from a Target Store before migration. In this case all the corrupted/modified data will be deleted. Your Source data will be moved to a clear Target Store, preserving relationships between entities. Please note! Clearing data from a Target Store is irreversible option, so we highly recommend to make a backup before restarting the migration. How Migration Insurance covers the costs of additional options? In case of restarting the transfer, Migration Insurance covers the cost of additional options that were selected during the initial migration. It means that you will not pay again for the options you have already payed before. You will be able to restart completely the same migration in one click from your account page. If you would like to add an extra option, or modify the migration (disable entities, etc.) you will need to contact our Support Team. How much Migration Insurance costs? Comparing to Remigration Service, Migration Insurance is much cheaper and costs only 9 - 13% of your total migration price. Why the prices vary? Basic Migration Insurance will cost 9% of your migration price. It allows you to restart data transfer at once during 7 business days after initial migration. Extended Migration Insurance will cost 11% of your migration price. It allows you to restart data transfer 2 times during 14 business days after initial migration. Premium Migration Insurance will cost 13% of your migration price. It allows you to restart data transfer 3 times during 60 business days after initial migration. If you will need to restart an insured migration, there will be an opportunity to do it in one click from your account page. The transfer will be completely the same as initial migration, including additional options selected before. In case you wish to add extra options that weren’t added during the first data migration, you will need to contact our Support Team. 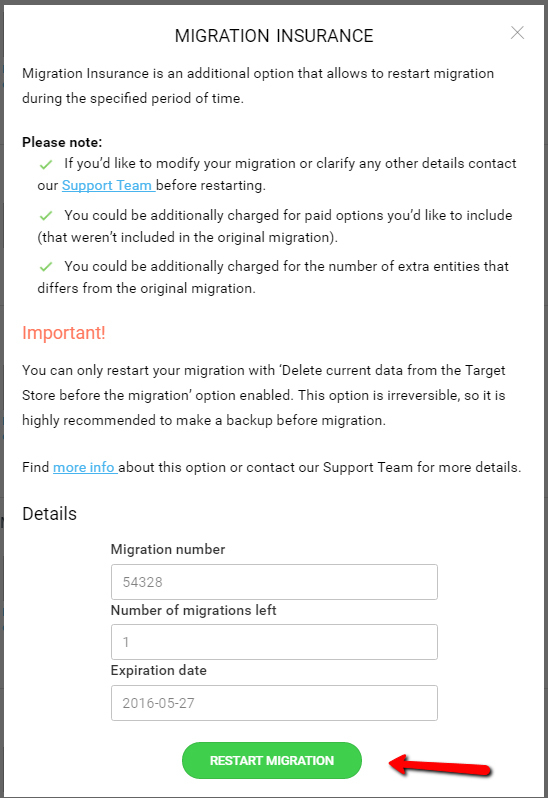 Free additional option called “Clear current data from a Target Store before migration” is included to every repeated migration. This will minimize the risk of mixed or duplicated data after migration. Please note! The additional option “Clear current data from a Target Store before migration” is irreversible, so it is highly recommended to make a backup before restarting migration. How can I change entities, additional options, remap order statuses, etc. for insured migration? Migration Insurance provides you with the opportunity to restart your transfer. This option is fully automated and does not allow to make any changes on your own. But if you need to add an additional option or to enable migration of extra entity, please, contact our Support Team. Please note: If you wish to add an extra entity or additional option, its price is going to be charged. In case you want to modify your insured migration considerably and change advanced settings that require Cart2Cart tech engineer’s extra time, purchase one of our Data Migration Service Packages. It is possible, if Cart2Cart performs some modifications in your store and during this period Migration Insurance expires. As we appreciate your patience and need some time to customize your online shop, Migration Insurance period is going to be extended to avoid the inconveniences. If you face some troubles after migration, there is a possibility to restart your insured migration in a pair of clicks. Just follow the steps below. 1. 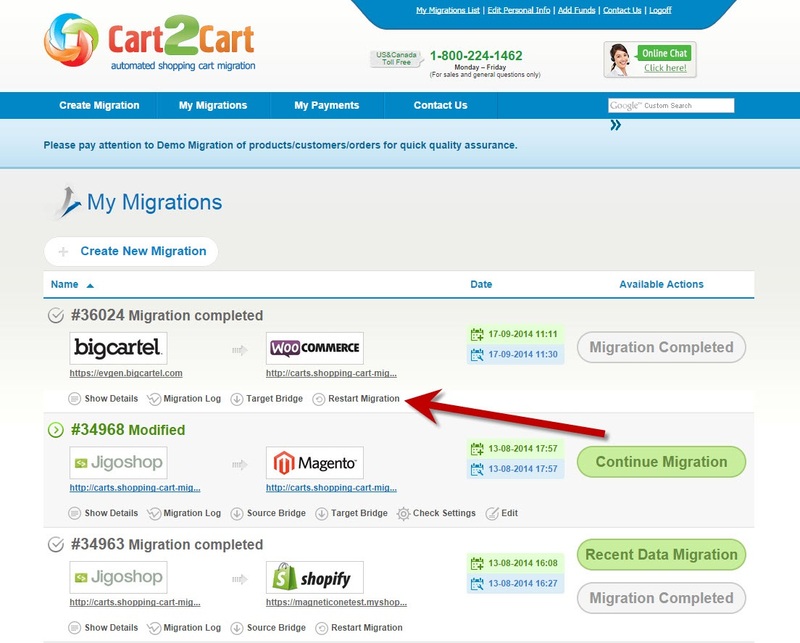 Log in to your Cart2Cart account and go to My Migrations List. 2. Choose the transfer that you wish to run again. 3. Press Restart Migration button. 4. Then, read the warnings, fill in the box and press the green button to restart existing migration. Please Note: You can only restart your migration with “Delete current data from the Target Store before the migration” option enabled. This action is irreversible, so it is highly recommended to make a backup before switch. If there are still some questions, please, do not hesitate to contact our Support Team for help. Migration Insurance vs Recent Data Migration - what’s the difference? 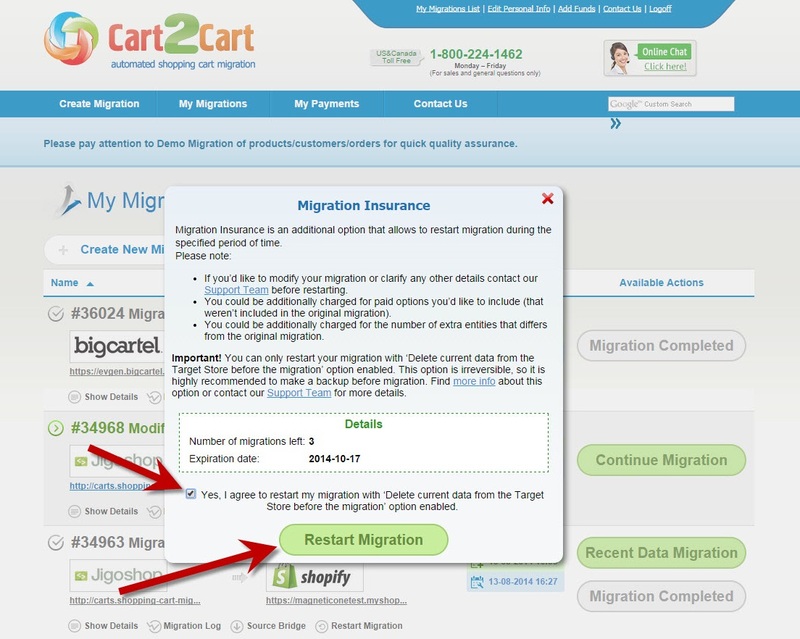 In addition to migrations themselves, Cart2Cart provides extra services to insure, speed up and enhance them. The two, useful, additional services we offer are Migration Insurance and Recent Data Migration - here, we’ll explain the key differences between them. Let’s start with short descriptions. Migration Insurance allows you to Remigrate - to completely restart your existing Full Migration - a certain amount of times during a certain period, depending on which plan you’ve chosen. Remigration means clearing all the entities from your target store and transferring data from the source cart to it, all over again. Recent Data Migration, on the other hand, permits you to transfer new entities exclusively to your target store after Full Migration is done. It takes a lot less time than Remigration (which is provided in Migration Insurance) and doesn’t affect the data that is already moved. Each of these additional services are easy to launch - find the needed migration in the migrations list in your account details and press the appropriate button. Recent Data Migration button will appear automatically after full transfer is completed, and so will Restart Migration button, if you ordered a Migration Insurance Plan beforehand.